A four-year letterman with the Michigan State Spartans, Kaleb Thornhill started three years at middle linebacker. He was also named a four-time All-Academic Big Ten selection and was elected team captain in 2007. Thornhill recorded 227 career tackles with 20.5 yards for losses in his collegiate career and was named Michigan State’s Potsy Ross Scholar/Athlete Award in 2007. The award is given to the team’s top senior scholar-athlete. Kaleb Thornhill was told by his late father Charles “Mad Dog” Thornhill that “you have much bigger things for your life beyond football”. Although he didn’t understand what they would be at the time, Kaleb kept searching for his purpose on earth throughout his playing career and realized why God gave him football. He found that most people he played with thought football was their calling in life and quickly realized how lives were dismantled, lacked purpose, and on a path of destruction. With a relentless pursuit, Kaleb devoted every single second, minute, and hour finding solutions to ensure that no football player would fail once the game was no longer a part of their life. He introduced a revolutionary player development program at Michigan State University while working under the Athletic Director. After that, he worked for the Detroit Lions in Player Development as an intern then received his big break at the age of 25. 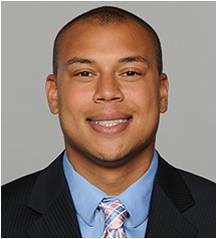 In February of 2010, Kaleb borrowed his Mom’s car to drive 255 miles to Indianapolis in order to get access to the NFL Combine where he was looking for one chance, one opportunity, one job that he was passionate about. He stayed in a friend’s hotel room and waited three days to get in front of the person he was looking for, Jeff Ireland, the current General Manager of the Miami Dolphins. He found Jeff Ireland, got an interview, borrowed money from his mom to get a shirt & a tie for the meeting, had a phenomenal meeting, and was asked to fly back down for a 2nd interview in Miami. Three days later he got on a plane to Miami and had his last interview with Bill Parcels (The Big Tuna!) before he was offered the job as Director of Player Development for the Miami Dolphins, the youngest person in NFL history to ever hold this title. He’s transformed hundreds of players’ lives in his 8 years with the Miami Dolphins and wanted to transform even more lives. He decided to solve the biggest problem once and for all – Professional Athletes failing once the game is no longer a part of their lives. This is when he developed the company ATU or Athlete Transition U, an organization that provides professional athletes the education, experiences and unparalleled network to catapult them into successful careers off-the-field. Through tailored educational combines, next chapter u transition program, and advisory services ATU ensures that professional athletes will be in the best possible position to succeed long after their playing days are over. As Kaleb Thornhill would say, this is just the beginning, we always have to keep building….brick by brick. Kaleb Thornhill is the co-founder of APEX Academy, a 501c3 non-profit organization. APEX Academy will provide under-resourced student-athletes with access to education, mentorship, and leadership development empowering them to reach their full potential. We were founded to guarantee that an individual’s current circumstances DO NOT indicate their future circumstances. APEX Academy will enforce a culture that continues to challenge the status quo by ensuring student-athletes can have personal and professional success long after they finish playing football. Our purpose is to engage, educate, and empower each individual we encounter to ensure they reach their full potential both ON and OFF the football field. To book Kaleb Thornton as a keynote speaker, please use the button above.